The Commonwealth Government’s Assessment Bilateral Agreement Draft Conditions Policy (Draft Conditions Policy) seeks to improve the efficiency of assessment bilateral agreements under the Environment Protection and Biodiversity Conservation Act 1999 (Cth) (EPBC Act). 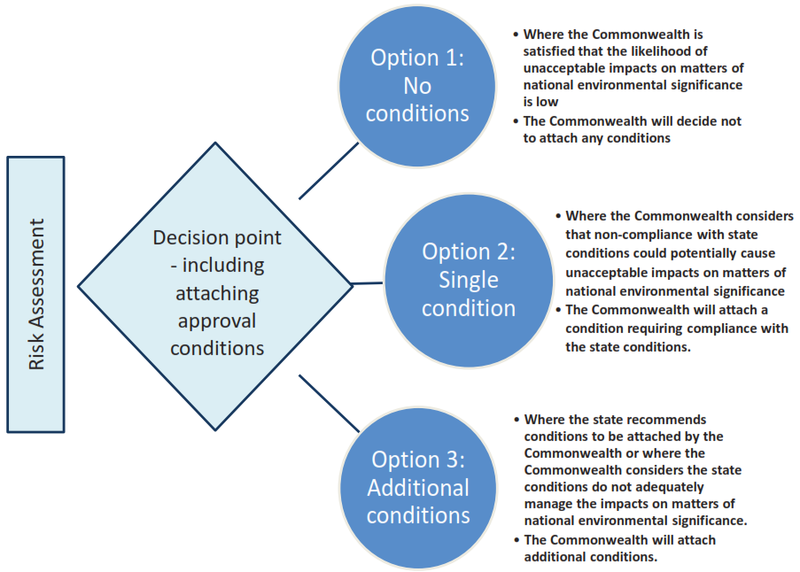 In particular, the Draft Conditions Policy seeks to minimise unnecessary duplication between state, territory and Commonwealth conditions on environmental approvals. The Draft Conditions Policy currently only applies to projects in NSW, but the Commonwealth will consider the extension of the policy to other states and territories following completion of the public comment period on 15 May 2015. In last week’s blog on the implementation of the Commonwealth Government’s ‘One-Stop Shop’ policy, we commented that assessment bilateral agreements under the EPBC Act are now in place in each state and territory but that the progress of approval bilateral agreements have stalled due to political opposition in the Senate. While assessment bilateral agreements go some way in addressing the project risks that arise from a parallel State and Commonwealth environmental approvals regime, the risk of increased project cost and delay will persist until the approvals bilateral agreements are finalised. different conditions are imposed by the NSW and Commonwealth decision-makers, which may be inconsistent, lead to increased project cost or require the implementation of different mitigation measures. Can approvals be streamlined without an approvals bilateral agreement? The assessment bilateral agreement only requires that the environmental assessment be carried out under the relevant NSW process and does not limit the ability of NSW or the Commonwealth decision-makers from granting or rejecting the project application or restrict their discretion to impose different conditions of approval. However, the updated assessment bilateral agreements contain provisions that should lead to more certain outcomes for projects. Reflecting the intent of the provisions of the updated assessment bilateral agreement, the Draft Conditions Policy seeks to minimise unnecessary duplication between state, territory and Commonwealth conditions on environmental approvals. Step 2: based on that assessment, except in exceptional circumstances, use a condition setting hierarchy for projects under a revised assessment bilateral agreement to reduce duplication with state and territory conditions of approval. The policy states that the risk assessment will include consideration of factors such as the sensitivity of the matter of national environmental significance likely to be impacted, the scale and intensity of the potential impacts, and the likelihood of compliance with state and territory conditions, including the compliance history of the proponent. The conditions setting hierarchy comprises three options, depicted in the following diagram sourced from page nine of the Draft Conditions Policy. attach additional conditions to protect matters of national environmental significance .